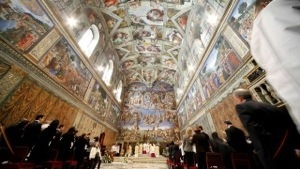 The app allows you to watch video from the Vatican, follow what is being said on Twitter, read news stories, as well as access all the important documents concerning the history and procedure of the conclave. It even has biographies of all the cardinal electors and ranks them according the “buzz” they are receiving on the internet—certainly not a reliable measure of who is going to be elected, but interesting nonetheless. 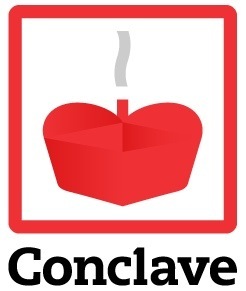 VATICAN CITY, March 12, 2013 (Zenit.org) – Beginning with the Conclave in 2005, in order to better distinguish the colour of the “fumate” (smoke signalling the election or non-election of a pontiff), a secondary apparatus is used to generate the smoke in addition to the traditional stove in which the Cardinal electors’ ballots are burned. This device stands next to the ballot-burning stove and has a compartment where, according to the results of the vote, different coloured-smoke generating compounds can be mixed. 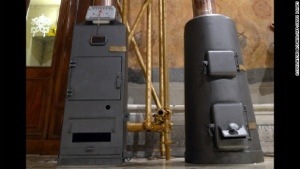 The result is requested by means of an electronic control panel and lasts for several minutes while the ballots are burning in the other stove. For a black “fumata” the chemical compound is made of potassium perchlorate, anthracene, and sulphur. The white “fumata” is a mixture of potassium chlorate, lactose, and rosin. The rosin is a natural amber resin obtained from conifers. Prior to 2005 the black smoke was obtained by using smoke black or pitch and the white smoke by using wet straw. 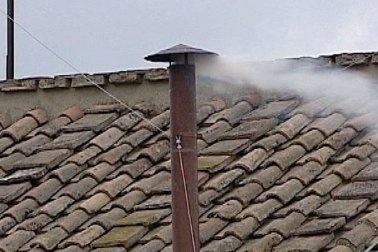 The stove-pipes of the stove and the smoke-producing device join up and exit the roof of the Sistine Chapel as one pipe leading to the chimney installed on the ridge of the roof, which is visible from St. Peter’s Square. To improve the airflow the pipe is pre-heated by electrical resistance and it also has a backup fan.